DN, Antibug’s the only one you’re missing then out of currently released dolls based on the in-show character designs. (There’s a hair-down, dress version of Chloe and Marinette both out but I don’t personally have any interest in them.) They did indicate at toy fair or a similar event that there are plans for Queen B and Rena Rouge dolls, but there were no prototypes yet and I’m hoping those are still in the works because they’ll be must-haves for me. I don’t know if you’re the type to tinker with doll repairs at all, but I’d be happy to send my broken Antibug your way if you’d have any use for her. I just don’t think I have the chops to do a decent repair job. I looked up those dress versions and I thought they were cute until I made the image larger and saw that Marinette's neck is ten feet long. No thanks. 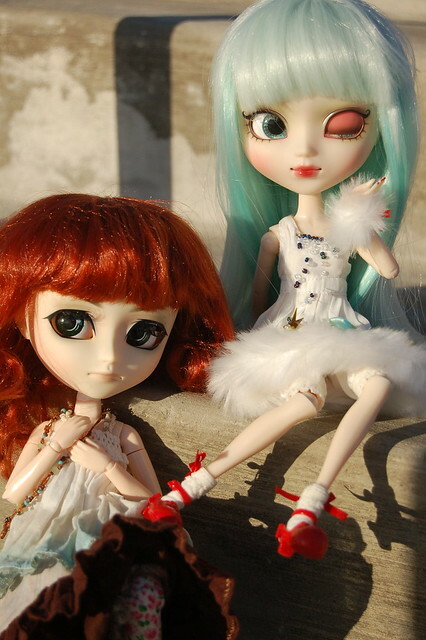 Tinkering with dolls and repairing dolls is one of my favorite passtimes, actually! I'd love to take your broken Antibug off your hands, thank you!! <3 Maybe it'll inspire me to get back to work on the rest of the work I've been meaning to do on my LB dolls. I wasn't happy with how inaccurate their hair is, so I fixed Ladybug's hair: https://www.flickr.com/photos/deadlynova...5sr-LrfUkr and gave her some freckles. I've been meaning to fix Marinette and Chloe's hair as well. What a cute little "house"! That wig is cute on her. I'm not familiar with the ladybug characters, but I wonder who won the battle...? (01-22-2018, 05:39 PM)DeadlyNova Wrote: I looked up those dress versions and I thought they were cute until I made the image larger and saw that Marinette's neck is ten feet long. No thanks. Ooh, I love what you've done with Ladybug! I've been meaning to tweak the hair on my girls too. I did do some detail painting on several of the plastic accessories to give them a bit more show accuracy; I just haven't gotten around to doing the hair. (01-23-2018, 11:03 AM)Alliecat Wrote: What a cute little "house"! That wig is cute on her. I'm not familiar with the ladybug characters, but I wonder who won the battle...? Sophie is particularly e ressive in this shot; good choice to use as your Doll a Week photo. They are beautiful!! I love the colors in this photo!! So this seems to be becoming a bit of a tradition: I don't hardly get the chance to look at photos and comment on them in other people's threads or reply to comments in my own thread except on weekends. I do read everything you guys say, and I really appreciate your encouragement and kind words; I just don't always get the chance to reply individually! I did actually take this picture last week when I was supposed to; I just didn't get around to posting it until today. We had a nice snowfall on Sunday which lent itself well to the picture, but it also caused some dangerous roads and we ended up going to rescue a friend of a friend who had rolled his car Sunday evening, eating up the time I had planned to use to post. The rest of the week I have no real excuse for other than the fact that I consistently lack motivation after work. Who better to photograph in the snow than Killer Frost? she is very cool, love all the blue. Is she a custom? If she is stock, who is she? Perfect setting for an ice princess. I like the way she is posed against some dry foliage amid the snow, which adds interest to the composition without distracting from the figure in the foreground. Be careful driving around out there in the ice and snow. Miss Edith, she is stock- she’s a DC Superhero Girls Frost doll. I have most of the signature dolls in the line because I’m obsessed with both DC superheroes and dolls, so of course I had to have them!